What Sense Are They Using? I just learned about something interesting... You can see what sense a person is using when they are thinking about someting by watching the direction their eyes move! 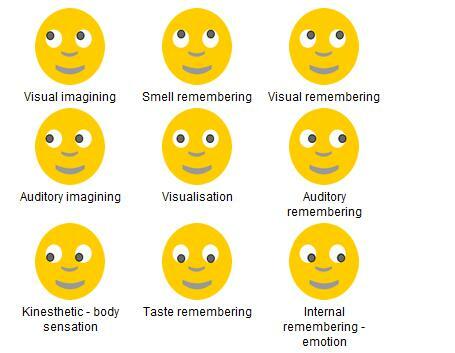 Try it out by asking someone to recall a pleasant memory then look at their eyes!Here is what their eye movements might tell you:*If they are remembering a scene, they are probably looking up to their left & if they are imagining a scene then they are probably looking up to the right. *If they are looking up, they might be remembering a smell. *If they are looking ahead into the middle distance, they are probably using more than one of the systems. *If they are looking to the right, they may be imagining sounds, & to the left they might be remembering sounds. *If they are looking down to the right they are feeling something through the body about the scene, & down to the left, they might be remembering an associated emotion. *And lastly. if they are looking down, they may be remembering a taste. tada...i try to remember all of this things that you have said..but i think it so many to memorize...actually these things that you have said is true for me..because sometimes i am like that...where did you get these informations? That's too much to remember. I think I'll leave the sense checking to the experts.